About | The Race Dr.
Pundit, prognosticator, agitator and commentator, Dave “The Race DR” Ross can currently be heard throughout the year on Sirius NASCAR Radio Channel 90. The Race DR began his broadcasting career in San Diego, CA at all-sports radio station XTRA-AM, Extra Sports 690 in 2000. It was there he hosted the weekly show “Track Smack” which led to on-air feature spots at various markets starting in Toledo at WIOT-FM where the Race DR would appear every Friday to preview each week’s race and return on Monday to review the race. Other cities including Chicago, IL; Greensboro, NC; Charleston, SC; Springfield, MA; and Wilmington, NC quickly followed. 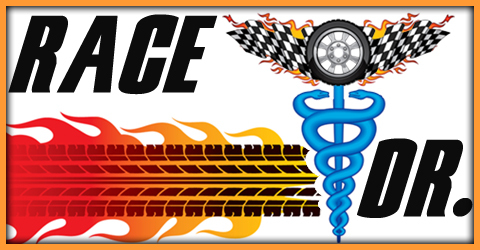 The Race DR has been heard twice weekly in Greensboro, NC on Rock 92’s morning show during the NASCAR season. Race DR had to step away in 2014.The Race DR has made many guest host appearances over the years on Sirius Satellite Radio’s NASCAR channel and spent 3 years hosting Sporting News Radio’s NASCAR show “Inside Track”. An avid fan of stock car racing, the Race DR became a rabid fan when he lived in Charlotte, NC in the 80’s.If you have any thoughts or questions please write me at dr@theracedr.com. Take a look around and enjoy!